There are two kinds of poetry; lyric and narrative. Lyric poems are generally short and express a thought or feeling. Narrative poetry is often longer and tells a story. Don Quixote is a novel written by Miguel de Cervantes in 1605. It tells the story of a slightly crazy old man who allows his imagination to run away with him. Don is fascinated by the adventures of knights and their heroic deeds. He does nothing but sit around reading and dreaming about knights, until one day he begins believing he is one. His imaginary world is forever running into the realities of the actual world. This, of course, leads to all kinds of comedy and tragedy. He sees a windmill and believes it's a giant. He meets a house maid and calls her a fair lady. 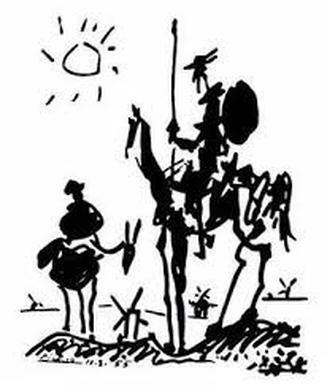 My narrative poem, Don Quixote, is considerably shorter than Cervantes' book. But whether it's a novel or a poem every good story has engaging conflicts. See if you can identify the struggles of Don Quixote, and then create one of your own.